Whole grain goodness. Serve up the side dish your family will love-- velveeta(r) rotini & cheese whole grain. 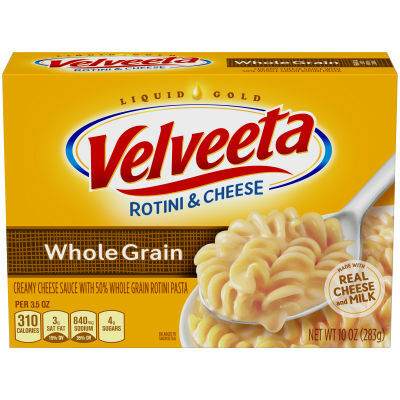 Made with smooth, creamy velveeta cheese sauce and 50% whole grain rotini, it's the perfect match for any meal. Just grab a fork and dig in. Who knew whole grain could taste this good? The best side of dinner. Contains 24g whole grain per serving. Serving size 3.5 (98g/ about 1/3 box) (Makes about 1 cup).